Chest compressions during cardiopulmonary resuscitation (CPR) can be traumatic to patients resulting in rib / sternum fractures. Sternal fractures occur in one out of five resuscitation attempts, and costal fractures occur in one out of three patients, with two-thirds of the patients with costal fractures having three or more fractures in adjacent ribs. 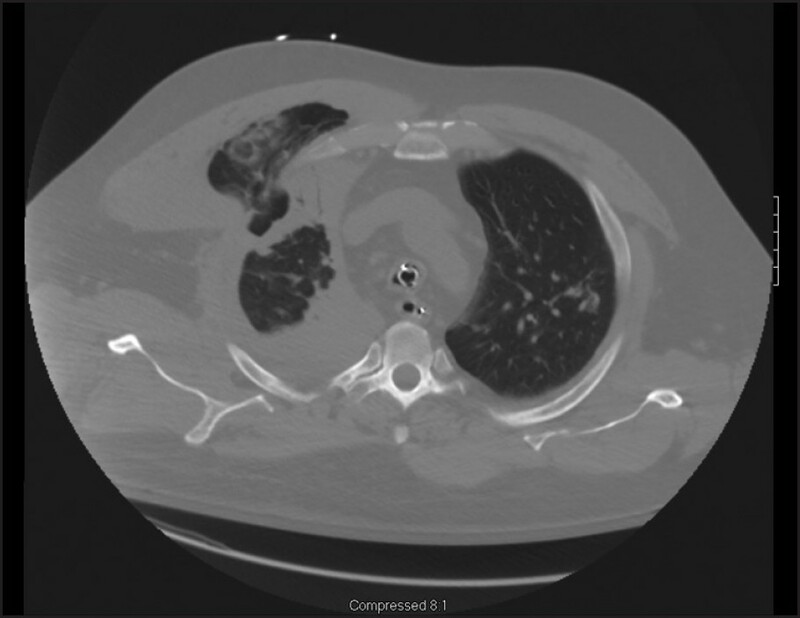 We report a rare complication of lung parenchymal herniation post CPR. A 56-year-old, previously healthy male, had a ventricular fibrillation cardiac arrest and return of spontaneous circulation after 10 minutes of CPR and shocks. He was intubated and hemodynamically stabilized in the Intensive Care Unit (ICU). Therapeutic hypothermia was initiated and then rewarming done after 24 hours. His neurological and cardiorespiratory status gradually improved over the next seven days. He was eventually extubated and placed on Bilevel positive air pressure (BiPAP). However, he started having respiratory distress with decelerating oxygen saturation. He had asymmetric chest wall movements, with the right side expanding more than the left side. He was re-intubated and a computed tomography (CT) scan revealed displaced fractures from the third to the sixth ribs and a herniated right-sided upper and middle lobe of the lung tissue, outside of the rib cage into the pectoralis muscle [Figure 1]. He was immediately taken to the Operating Room (OR), where an emergency repair of a large right lung hernia with a right pectoralis major muscle flap, open-reduction and internal fixation of multiple right-sided rib fractures, and drainage of the right pleural effusion was done, followed by chest tube placement. He had an uneventful recovery, was re-extubated and transferred to the floor. In CPR-induced lung herniation, patients may also be asymptomatic, but clinical suspicion should be high, especially if rib fractures are suspected or confirmed radiographically. Lung herniation should be considered whenever a patient has a bulging mass in the anterior thorax, intractable pain at the site of a potential fracture, ongoing dyspnea with no definite etiology, subcutaneous emphysema, suspicious (especially bloody) pleural effusions or pneumothorax after CPR. 1. Hoke RS, Chamberlain D. Skeletal chest injuries secondary to cardiopulmonaryresuscitation. Resuscitation 2004;63:327-38. 2. Krischer JP, Fine EG, Davis JH, Nagel EL. Complications of cardiac resuscitation. Chest 1987;92:287-91. 3. Allen GS, Fischer RP. Traumatic lung herniation. Ann ThoracSurg1997;63:1455-6. 4. Kottachchi DT, Dong J, Reid S. A rare complication of cardiopulmonary resuscitation. Can J Surg 2009;52:E1-2.